Foreign Objects; Ingestion; Children; Endoscopy; Complications. Our study is the first of its type in Oman to describe the frequency of FB ingestion in children, the types of FBs ingested, the burden of endoscopic intervention, and the frequency of complications as seen in Royal Hospital, Oman. Pediatric endoscopy is only available in Royal Hospital as the sole center of pediatric gastroenterology services in the country. We sought to increase the awareness of pediatricians, pediatric emergency specialists, and gastroenterologists about the impact of FB ingestion in children in a general hospital. Our study also allows comparison of patterns of FB ingestion in Oman with other parts of the world. We conducted a retrospective study in which we analyzed the electronic medical records of 585 children under the age of 13 who visited Royal Hospital following FB ingestion. We used data collected from 1 January 2011 to 31 December 2014. Complications were divided as clinically significant if they were life-threatening, required further medical management, or when more than grade one mucosal injury occurred based on Zargar’s classification.10 Non-significant complications were considered when any abnormality noted in the patient as a result of FB ingestion did not fall in the previous categories. The data were analyzed using Excel 2010. Values of mean, median, standard deviation, and interquartile range were calculated as appropriate. The study was approved by the ethical committee of the Royal Hospital. 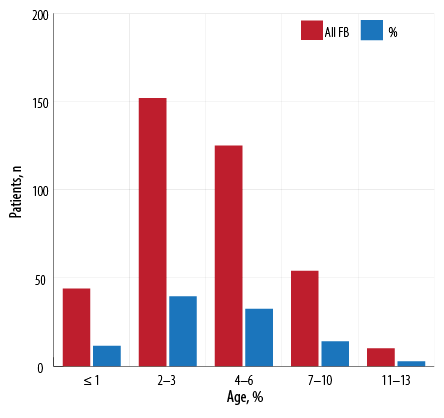 Figure 1: Age distribution of children who ingested foreign bodies (FBs). Of 585 children diagnosed with FB ingestion, 385 children were enrolled for analysis. There were 225 (58.4%) males and 160 (41.6%) females, with a male to female ratio of 1.4:1.0. The mean age of the enrolled group was 4.0±2.6 years (median 3.0 years); 50.9% of the children were < 3 years old, and 11.4% of children were ≤ 1 year old. Nearly one-third of the children were 4–6 years old. Figure 1 shows the age distribution of children who had FB ingestion. The median time of presentation to the ED was 3.0 hours with an interquartile range of 13.5 (2.0–15.5) hours. The most common FB ingested were coins (41.3%) followed by disc batteries (12.2%). Table 1 shows types of ingested FBs among studied Omani children. Fifty patients’ families did not know when the child ingested the FB (13.0%). Table 1: Types of foreign bodies ingested among studied Omani children. Table 2: Radiological location of the ingested foreign body on presentation. The anatomical location of the FB based on plain X-ray was variable as patients presented at different times following ingestion allowing movement of the FB through the gastrointestinal system. One-quarter of patients had the FB in the stomach and another quarter had the FB in the small intestine upon presentation to the ED. In 10.9% of children, the FB was in the esophagus, and 16.1% of children had no FB on radiological investigations. Table 2 shows the location of the FB on X-ray at presentation. EGD was performed in 63 children (16.3%). No colonoscopies were required. Thirty-nine children (61.9%) required EGD removal of the FB from the esophagus, 21 children (33.3%) had the FB removed from the stomach, and two children from the duodenum. One child had no identifiable FB on EGD. FBs removed during urgent EGD were mainly coins (44.4%) followed by disc batteries (14.3%) from the esophagus and stomach [Table 3]. Pins and needles being sharp and long (3–4 cm) presented in 23 (6.0%) children, and only eight of the 23 patients (34.7%) required urgent EGD. EGD was performed to remove such objects if they were within reach of the endoscope in the stomach or proximal part of the duodenum and in compliance with NASPGHAN guidelines.9 The majority (65.2%) of ingested pins or needles passed spontaneously through the bowels with no complications. Only 20 children (5.2%) had complications following FB ingestion [Table 4]. Six children (1.6%) had clinically non-significant complications. This included five children with grade 1 mucosal injury as classified by Zargar10 and one infant had perianal ulceration after contact with a disc battery in his diaper. Among the 14 children (3.6%) with clinically significant complications, nine had grade 2a mucosal injury, one had grade 2b injury, and two had grade 3a necrosis using Zargar’s classification.10 One child had pulmonary atelectasis on X-ray post-endoscopy, and one child required rigid endoscopy to remove an embedded disc battery from the upper esophagus. The latter child also needed pediatric intensive care unit admission for further treatment for pneumomediastinum. There were no mortalities. Table 3: Indications of urgent esophagogastroduodenoscopy in children. Table 4: Frequency of complications from foreign body ingestion. FB ingestion in children is a common problem, but unfortunately, there is a scarcity of published data in the developing world. We report data from 385 children with FB ingestion taken between 1 January 2011 and 31 December 2014 from the only referral center for pediatric endoscopy in Oman. This number is relatively large compared to a study from Turkey of only 64 children aged 7–17 years old.12 Another study from Romania reported only 61 cases in children over six years old.13 The reason for this discrepancy could be because our center was the main referral center for pediatric endoscopy in Oman during the study period. On top of this relatively high number compared to other centers, there are probably many other children in other areas of the country not referred to Royal Hospital due to under-recognition by parents or doctors, under referral by the primary doctor, or merely logistics issues reaching the hospital. The types of FBs ingested are in line with other studies; coins remain the most common item ingested by children in our study.1,12 Coins being non-sharp and relatively resistant to chemical decomposition are not a cause of great morbidity or mortality in general. Our study is in line with other studies, which highlighted the peak incidence of FB ingestion in 3–4 years old.14 This is understandable as this the developmental phase when children are explorative and curious in general while being fully mobile and active. The indication of endoscopy was mainly EGD for esophageal coins. Disc batteries were the second most commonly ingested FB and the second most common indication of urgent EGD making up to 14.3% of procedures. While disc battery management can be controversial, it is our policy to remove all disc batteries from the esophagus immediately and from the stomach within 48 hours. This is also in compliance with the recommendation by NASPGHAN.9 Disc batteries are associated with higher morbidity including esophageal ulcerations and perforations compared to a chemically inert material such as a coin. The Center of Diseases Control and Prevention reported 13 deaths from disc battery ingestion; all children were aged two or younger.15 In our study, 47 children (12.2%) ingested disc batteries and nine (20.5%) were under one year old. This study raises serious concerns regarding children under the age of one year having ingested disc batteries. The proportion of children with disc battery ingestion is relatively high compared to a Romanian study where only 6% of children had disc battery ingestion.13 On the other hand, our findings are similar to a study from Korea where disc batteries were second to coin ingestion with a prevalence of 15.8%.16 It is likely that the disc battery ingestion will remain a growing issue particularly as more electronic games are available and within reach of children. One-year-old children are not fully verbal of their symptoms leaving the family with the responsibility of vigilance to detect a problem that could be potentially very serious. Regarding sharp object ingestion, this study demonstrates that most pins and needles up to 4 cm in length pass through the gut spontaneously without complications. Only eight children in the pin and needles category of ingestion required urgent endoscopic removal out of 23 children (34.7%). The rest of the children who ingested needles or pins had no complications as they were beyond the reach of endoscopy. Based on these findings, it might be argued that pediatric gastroenterologists should have the option of waiting longer for sharp objects to pass spontaneously if the risk of doing an endoscopic procedure under general anesthesia outweighs the risk of having the FB pass spontaneously. This approach is not yet widely considered. Finally, the rate of 3.6% clinically significant complications, although low, should not give a false sense of security. Particularly since disc batteries can potentially be fatal even though our study saw no fatalities. This study helps pediatricians and pediatric gastroenterologists in Oman and perhaps surrounding countries to have a wider understanding of the patterns and outcomes of different types of FB encountered in pediatric EDs of a major tertiary hospital. This knowledge and understanding, in turn, will lead to better counseling of the families of these children as well as better management of children with FB ingestion. FB ingestion is relatively common in toddlers. Although the time of presentation to the ED is fairly late, the need for urgent endoscopy is nearly 26.1%. In general, complications are not common if all types of FBs are considered. Performing urgent endoscopy needs to be carefully assessed based on the risks of complications. A low complication rate should not give a false sense of security in FB ingestion especially of disc batteries. 1. Bronstein AC, Spyker DA, Cantilena LR Jr, Rumack BH, Dart RC. 2011 Annual report of the American Association of Poison Control Centers’ National Poison Data System (NPDS): 29th Annual Report. Clin Toxicol (Phila) 2012 Dec;50(10):911-1164. 2. Uyemura MC. Foreign body ingestion in children. Am Fam Physician 2005 Jul;72(2):287-291. 3. Aydoğdu S, Arikan C, Cakir M, Baran M, Yüksekkaya HA, Saz UE, et al. Foreign body ingestion in Turkish children. Turk J Pediatr 2009 Mar-Apr;51(2):127-132. 4. Mirshemirani A, Khaleghnejad-Tabari A, Kouranloo J, Sadeghian N, Rouzrokh M, Roshanzamir F, et al. Clinical evaluation of disc battery ingestion in children. Middle East J Dig Dis 2012 Apr;4(2):107-110. 5. Kimball SJ, Park AH, Rollins MD II, Grimmer JF, Muntz H. A review of esophageal disc battery ingestions and a protocol for management. Arch Otolaryngol Head Neck Surg 2010 Sep;136(9):866-871. 6. Gregori D, Scarinzi C, Morra B, Salerni L, Berchialla P, Snidero S, et al. Ingested foreign bodies causing complications and requiring hospitalization in European children: Results from the ESFBI study. Pediatr Int 2010 Feb;52(1):26-32. 7. Yalçin S, Karnak I, Ciftci AO, Senocak ME, Tanyel FC, Büyükpamukçu N. Foreign body ingestion in children: an analysis of pediatric surgical practice. Pediatr Surg Int 2007 Aug;23(8):755-761. 8. Lee BK, Ryu HH, Moon JM, Jeung KW. Bowel perforations induced by multiple magnet ingestion. Emerg Med Australas 2010 Apr;22(2):189-191. 9. Kramer RE, Lerner DG, Lin T, Manfredi M, Shah M, Stephen TC, et al. Management of ingested foreign bodies in children: a clinical report of the NASPGHAN Endoscopy Committee Pediatr Gastroenterol Nutr 2015 Apr;60(4):562-574. 10. Zargar SA, Kochhar R, Nagi B, Mehta S, Mehta SK. Ingestion of corrosive acids. Spectrum of injury to upper gastrointestinal tract and natural history. Gastroenterology 1989 Sep;97(3):702-707. 11. Şencan A, Genişol İ, Hoşgör M. Esophageal button battery ingestion in children. Ulus Travma Acil Cerrahi Derg 2017 Jul;23(4):306-310. 12. Dereci S, Koca T, Serdaroğlu F, Akçam M. Foreign body ingestion in children. Turk Pediatri Ars 2015 Dec;50(4):234-240. 13. Diaconescu S, Gimiga N, Sarbu I, Stefanescu G, Olaru C, Ioniuc I, et al. Foreign bodies ingestion in children: experience of 61 cases in a pediatric gastroenterology unit from Romania. Gastroenterol Res Pract 2016;2016. 14. Chinski A, Foltran F, Gregori D, Ballali S, Passali D, Bellussi L. Foreign bodies in the oesophagus: the experience of the Buenos Aires Paediatric ORL Clinic. Int J Pediatr 2010;2010. 15. Centers for Disease Control and Prevention (CDC). Injuries from batteries among children aged <13 years — United States, 1995–2010. Morbidity and Mortality Weekly Report 2012 August 31;61(34):661-666. 16. Lee JH, Lee JH, Shim JO, Lee JH, Eun B-L, Yoo KH. Foreign body ingestion in children: should button batteries in the stomach be urgently removed? Pediatr Gastroenterol Hepatol Nutr 2016 Mar;19(1):20-28.